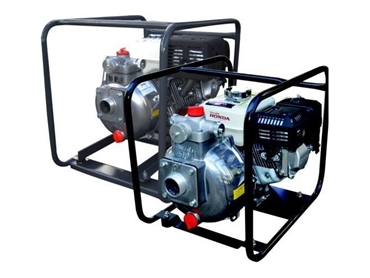 Australian Pump Industries offer lightweight and portable high pressure pumps which are ideal for both farmers and professional fire fighting authorities around the world. The Aussie Fire Chief QP205S is designed to out perform all other portable fire fighting pumps by using significant quality features including a huge 7 ½ diameter and a one piece impeller that weighs 2 ½ times more than impellers in other pumps. Large water passages allow for more water to get through the pump and this is made possible by the pumps big belly body. Producing flows of up to 450 litres per minute and heads as high as 75 metres, the pumps basic engine is a Honda 5.5 HP four stroke with oil alert, low oil protection and a cast iron cylinder bore in conformance with tough international environmental emission standards. The high pressured Fire Chief pumps also come with anti vibration mounts, steel skids and handle as standard equipment.